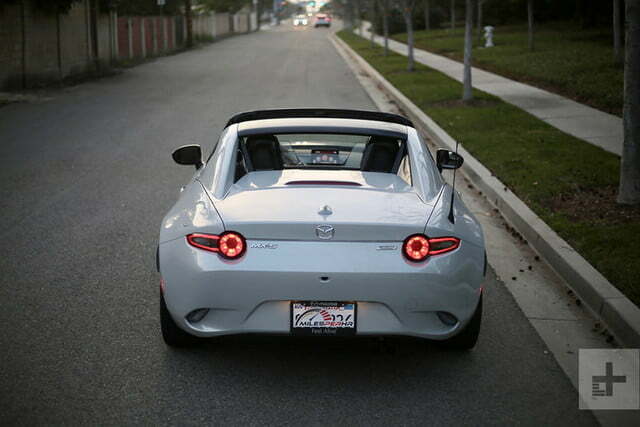 Life has few guarantees: death, taxes, and a spectacular drive at the helm of a Miata. 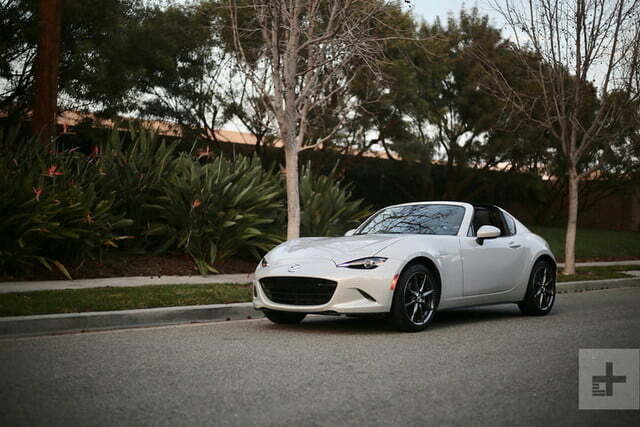 The Mazda MX-5 Miata plays the game a different way. Instead of filling out a spec sheet with heroic numbers, the pint-sized two-door brings the thrill of driving to saner speeds. For 30 years, the Japanese automaker has built its roadster with the same basic principles: lightweight design, rear-drive dynamics, and ample feedback. 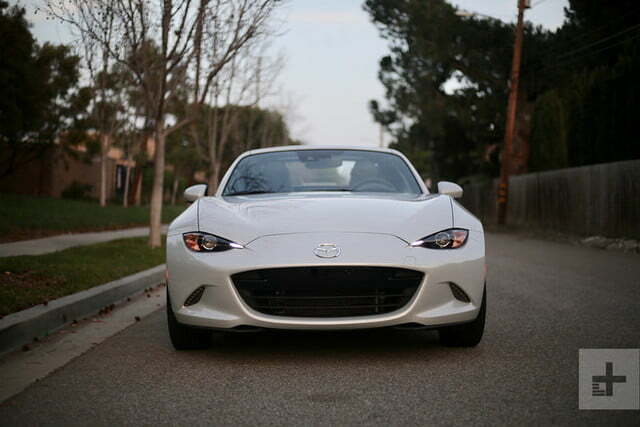 To distill it all into two words, the MX-5 offers accessible performance. Such automotive purity has resonated with over a million customers, and it has elevated the MX-5 to a place of sovereignty among enthusiasts. Still, the car isn’t perfect. Specifically, critics cite the MX-5’s diminutive power compared to similarly-priced rivals. Mazda, true to form, has always ignored complaints, but for the 2019 model year, a concession has at last been made. 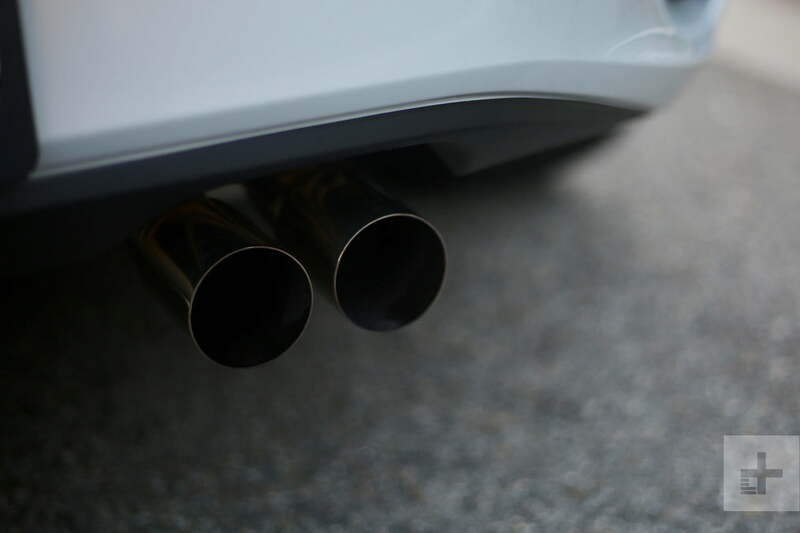 A bump in output and a revised powerband promises to enhance the sports car’s already entertaining character while maintaining its accessibility. 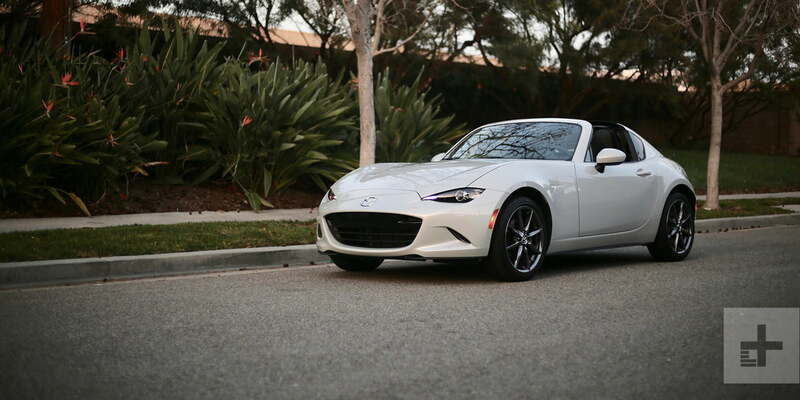 Our test of the hardtop RF model in Grand Touring, GT-S trim ($34,980) gauges the MX-5’s blend of convenience, style, and handling amidst a set of fiercely competitive rivals. The fourth generation (ND) MX-5 is by far the most handsome, with a friendly yet purposeful stance, curvaceous bodywork, and sharp light signatures. 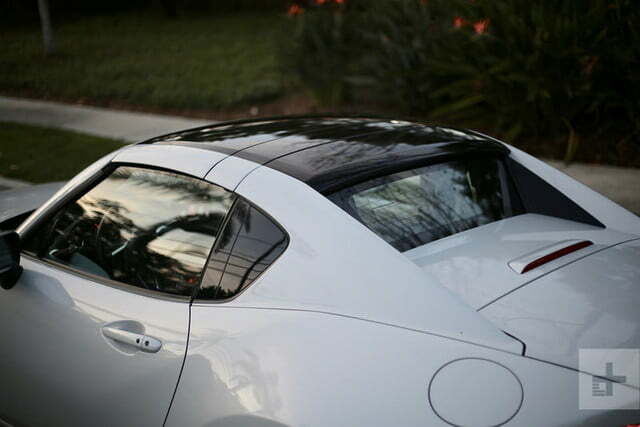 RF (retractable fastback) versions improve upon the sports car’s looks with a targa-style hard top that integrates seamlessly with the rest of the exterior. Converting the power-folding roof takes less than 15 seconds, but unlike some sports cars, you can’t make the switch while moving any faster than a crawl. Top up or down, the RF’s sweptback buttresses are seriously cool and draw a surprisingly amount of attention given the car’s price point. 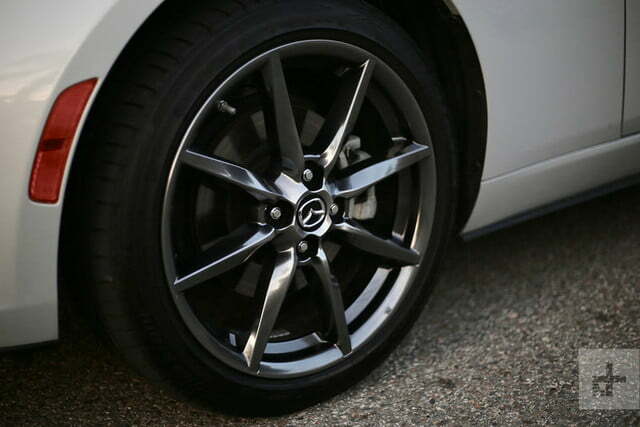 Grand touring trims swap the standard black 16-inch wheels for dark silver 17-inch units wrapped in 205-section summer tires. The limited selection of paint colors is mostly subtle, save for Mazda’s distinguished soul red crystal – a deep yet dazzling hue no other mainstream automaker can match. Thanks in part to short overhangs and tapering bodywork, the MX-5 doesn’t appear all that small on its own. Parked next to pretty much any other car, however, the roadster looks downright tiny. The diminutive impression doesn’t improve when you crawl inside the cabin, either. A narrow console separates driver and passenger, meaning – much like economy air travel – someone must yield the center armrest. Rearward seatback articulation depends on how far forward you can send the seat bottom, but passengers should probably rule out comfortable naps on long trips. Top up or down, the RF’s sweptback buttresses are seriously cool and draw a surprisingly amount of attention. How well taller drivers will fit isn’t a question of overall height, but rather of leg and torso length. Those with long (but not NBA-level) legs should find a comfortable position thanks to the addition of a tilt and telescoping steering wheel for 2019. Tall torso individuals, however, may find themselves staring at the roof’s cross-member – even with the seat in its lowest setting. Cargo capacity is another concern, with just five cubic feet available in the narrow-opening trunk. All told, it’s one of the least practical cars in its competitive set. 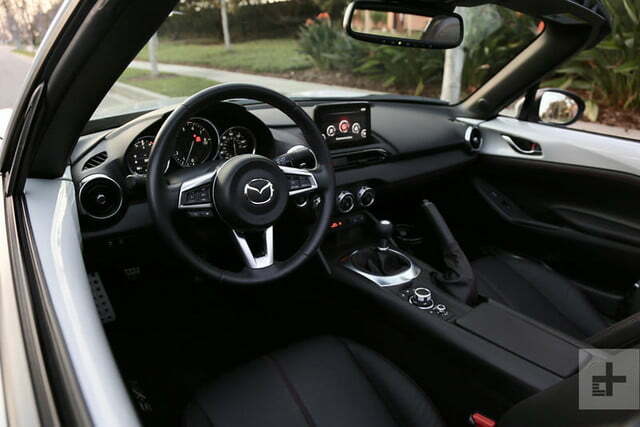 Once you’ve accepted the MX-5’s cozy digs, you begin to appreciate the interior’s design and layout. A two-tiered dashboard with a slight driver orientation is pressed as far towards the windshield as possible to give the impression of space. Knurled, brushed metal dials and air vent covers blend with contrast-stitched leather covers for the hand brake and shifter boot. A large analogue tachometer is flanked by an easy-to-read speedometer and color TFT display. 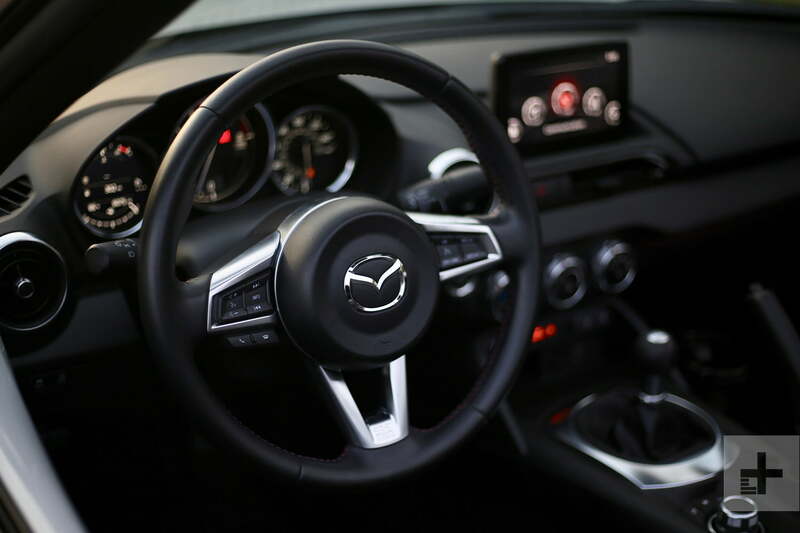 The soft, leather-wrapped steering wheel is the perfect size and thickness. Body color-matching door trim adds a pop of color to the black interior. 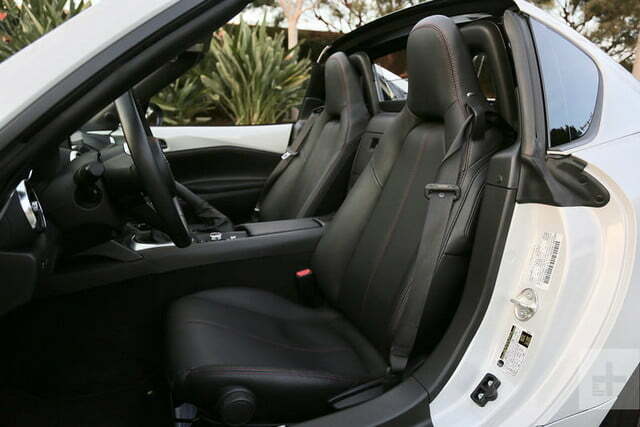 Base model MX-5s come with comfortable sport seats wrapped in fabric. Upgraded trims cover the same chairs in leather. Customers that choose the Recaro/BBS/Brembo package receive Recaro sport bucket seats with thicker side and bottom bolsters to keep passengers snug while cornering aggressively. While there are some cheaper materials to be found at knee level, the MX-5’s cabin is of appropriate quality for the car’s purpose and price. Little about the 2019 Mazda MX-5 is cutting edge (it still has a physical handbrake, for example), but upper trims offer just enough tech to keep you out of the dark ages. 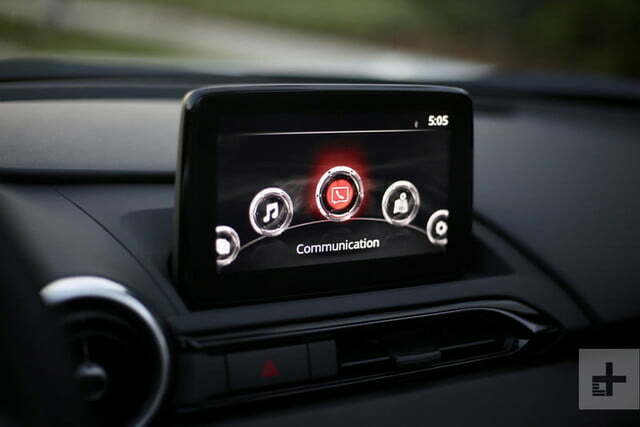 The Mazda Connect infotainment system, viewable via a 7.0-inch center display, is blissfully simple thanks to a clean menu and intuitive rotary controller on the center console. Finding anything you need within the system takes no more than a few turns and presses of the dial, or swipes and taps on the touchscreen monitor. Graphics and responsiveness are behind competitor infotainments, and the absence of Apple CarPlay and Android Auto (which are available on other Mazda vehicles, and on many of the MX-5’s rivals) is a bummer. 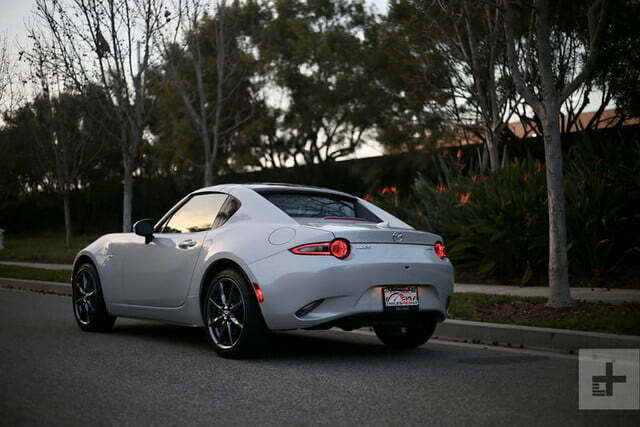 Convenience goodies on Grand Touring models are solid, including a Bose nine-speaker sound system, rain-sensing wipers, heated front seats, automatic climate control, auto-dimming mirrors, keyless entry and ignition, navigation, Sirius XM radio, and a backup camera (standard on all 2019 MX-5s). Available driver assistance technologies include blind spot monitoring, rear cross-traffic alerts, lane departure warning, and automatic emergency braking. We’ve always just accepted the Miata’s puny power for the sake of its sensational handling and featherweight fun. No more, however, because Mazda’s engine tweaks for the 2019 model year finally give the MX-5 the perfect amount of grunt. Every corner is a contest, every gear change a pleasure, and every run up to redline a thrill. Improvements of 26 horsepower and three pound-feet of torque don’t sound like much, but when you’re manipulating just 2,450 pounds (subtract 113 pounds for ragtop versions), that extra grunt translates to serious oomph. Now delivering 181 hp and 151 lb-ft of torque from a reworked 2.0-liter four-cylinder, the MX-5 is no longer overwhelmed off the line and at highway speeds. How that power is served is equally important: peak torque comes in lower than before (now at 4,000 rpm), peak power is offered much higher in the rev range (now at 7,000 rpm), and you can wring out the drivetrain to a new redline of 7,500 rpm. For those that like to autocross their cars, these changes mean you’ll be able to run short courses without leaving second gear and longer courses without exiting third. 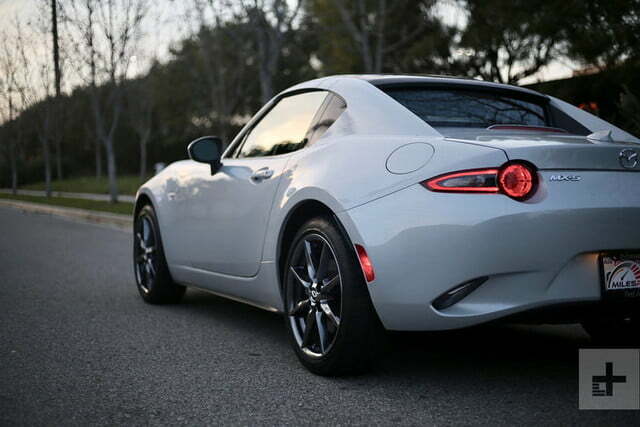 For everyone else, the updated MX-5 is simply more eager and more capable in a variety of driving scenarios. Also new for 2019 is the GT-S package, which upgrades Grand Touring models with the same performance hardware as Club trim cars. 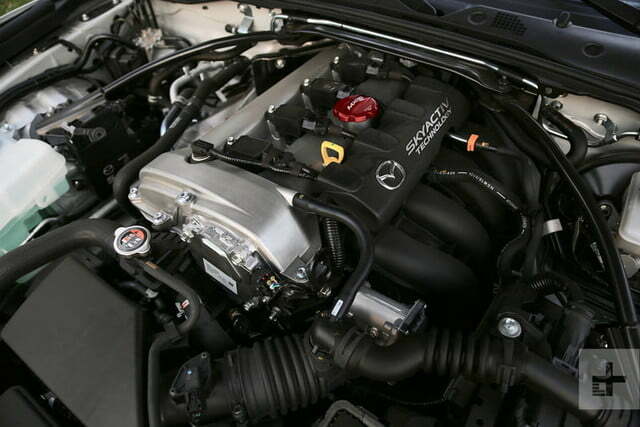 Included is a limited-slip differential, front shock tower brace, and sport tuned suspension with Bilstein shocks. 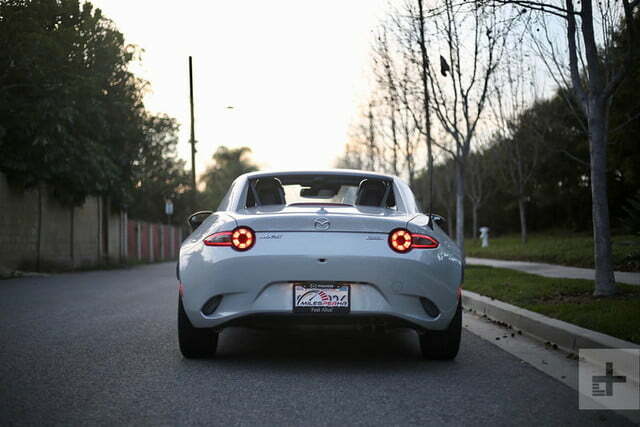 The beauty of driving an MX-5 has always been its low-speed thrills, and while the 2019 model continues to satisfy on trips to the grocery store or even on the way to work, the dollop of extra power makes it more rewarding on canyon roads and long, sweeping corners. Body roll is the ever-present hallmark of unmodified MX-5s, and though that remains a trait of the refreshed version, it doesn’t impact cornering confidence in the slightest. And if you ever tire of the sagging motion, a thick set of swap bars will work wonders. 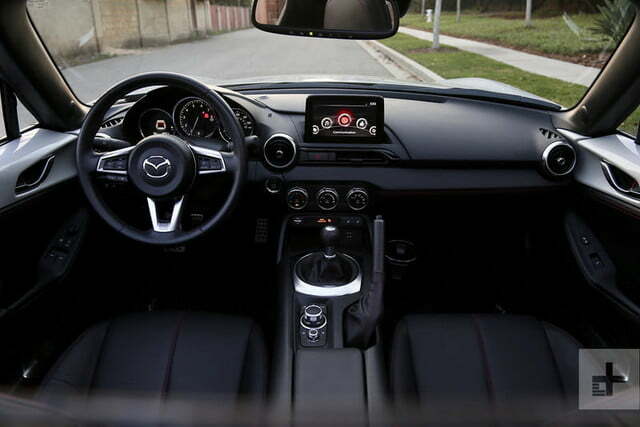 Once you’ve accepted the MX-5’s cozy digs, you begin to appreciate the interior’s design and layout. Steering and shifting are a driver’s engagement points, and the MX-5 does both better than just about any other car with a five-figure price. Light, direct, and with just enough feel to let you know when understeer or oversteer is imminent, the MX-5’s steering is beautifully dialed. 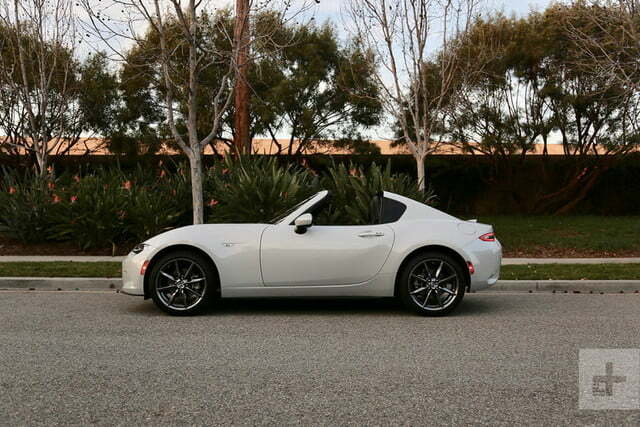 Having remedied the transmission foibles of its 2016-2018 models, Mazda equips the freshened MX-5 with a crisp-shifting six-speed manual that’s both easy to operate and precise. 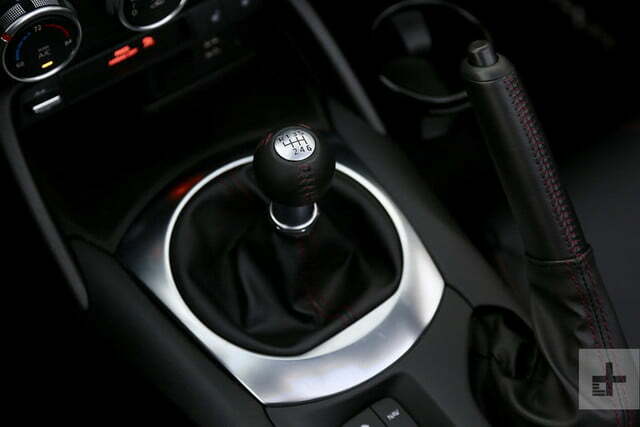 Customers can also choose a six-speed automatic, but we strongly encourage getting the most out of the MX-5 by opting for the stick. Punch the throttle all you want – the MX-5 will still return fantastic mpg figures. Despite the extra power, fuel economy has actually improved by one mpg on the highway for manual-equipped cars (now at 24 city, 34 highway, and 29 combined mpg). Those who opt for the automatic do even better, at 26 city, 35 highway, and 30 combined. Due to its broad appeal and wide pricing domain, the 2019 MX-5 invites a long list of competitors. On the low end, the Toyota 86 ($27,375) and Volkswagen GTI ($28,490) are the obvious opponents, but as the options list grows, the Camaro Turbo 1LE ($30,995) and Honda Civic Type-R ($36,620) come into view. 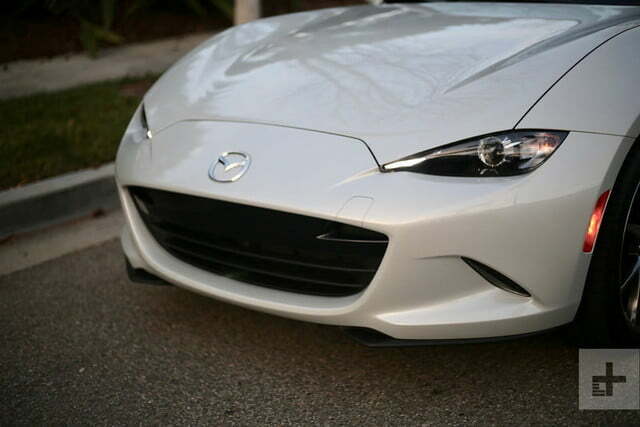 Power is not the MX-5’s strength, but its featherweight design does factor into its performance. Despite an output disadvantage to the Toyota 86 (205 hp) and Golf GTI (220 hp), the MX-5 soft-top out-hustles both sports cars to 60 mph (the MX-5 RF ties the GTI). 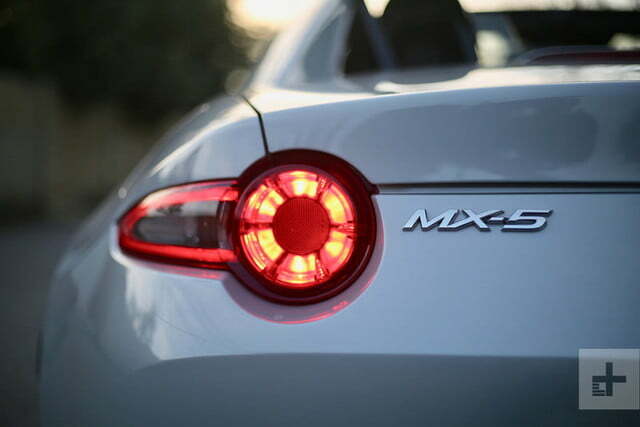 In a straight-line contest against the Type R and Camaro 1LE, however, the MX-5 doesn’t have a chance – both vehicles hover around the 5.0-second to 60 mph mark. Livability is also a factor, and the Miata’s micro cabin and cargo hold are easily the tightest quarters for passengers and their luggage. 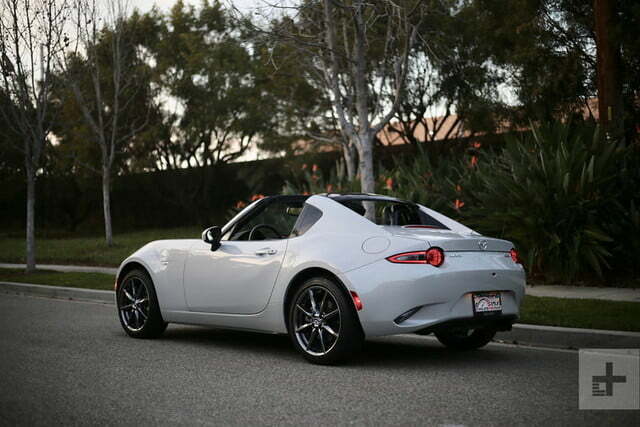 Where no other sports car can match the MX-5, though, is its fuel efficiency (it returns between one and four mpg better than the aforementioned rivals) and maneuverability (try parking that Camaro in a city). Mazda’s new vehicle warranty covers three years or 36,000 miles and the powertrain warranty lasts five years or 60,000 miles. Additionally, every new Mazda is eligible for a three-year, 36,000-mile roadside assistance program. Though this is technically a review of the RF version MX-5, if it were our money on the line, we’d stick with the cheaper, lighter ragtop. The introduction of the GT-S package for 2019 allows us to build an MX-5 with all the safety and convenience goodies of the Grand Touring model, while retaining the go-fast bits of the Club trim. Decked out in Ceramic Metallic with the standard manual gearbox, our ideal MX-5 would set us back $32,225 (including destination). Owning a vehicle built purely for fun is a luxury few can enjoy. 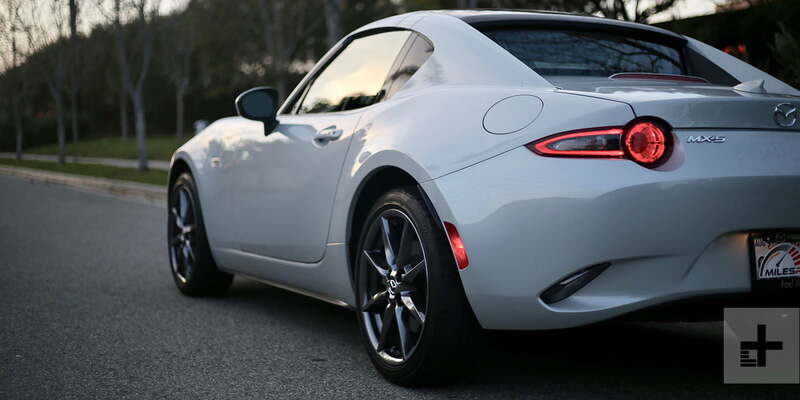 One could argue the Miata is daily drivable (I did), but the moment you need anything resembling practicality, you’ll be trading up to a larger car. To different degrees, every one of the MX-5’s rivals is more accommodating, which makes it hard to prescribe the MX-5 to every enthusiast. However, those with the flexibility of a second car or a minimalist lifestyle simply won’t find a more consistently engaging driving experience than that of the MX-5. Every corner is a contest, every gear change a pleasure, and every run up to redline a thrill. 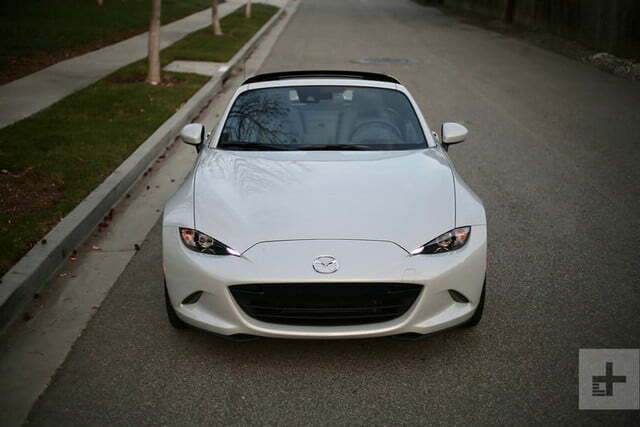 Life has few guarantees: death, taxes, and a spectacular drive at the helm of a Miata. Better than ever, we loved every minute behind the wheel of the 2019 Mazda MX-5 — and so will you.